The U.S. National Endowment of the Arts Jazz Master Awards is an annual event honoring individuals in the jazz community recognizing their important contributions, whether as performing artists, educators, composers or arrangers. Traditionally this award is given at the IAJE Convention during its gala concert and this year, held in Toronto from January 9th – 12th, the honors went to Andrew Hill (1931 – 2007), Quincy Jones, Tom McIntosh, Gunther Schuller, Joe Wilder and Candido Camero. As is often the case, some of the awardees are featured in panel discussions or clinics during one of the four days to highlight their contributions, discuss a particular work, or talk about some of their life experiences while touring. 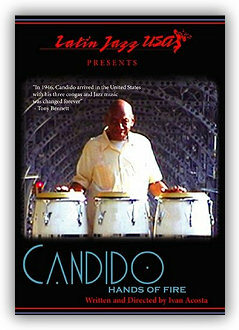 I was lucky to have a chance to attend one with the Cuban percussionist Candido Camero, who was recently the subject of the 2005 documentary Candido: Hands on Fire. Aptly organized and conducted by the soprano saxophonist and Toronto native Jane Bunnett, the hour with the legendary conga player gave a glimpse into this vibrant and charming innovator. A spry 87 year old, he inspired everyone when asked which of the hundreds of CDs he's recorded was his favorite, answering, "the next one." Born in Havana, Cuba in 1921, he played bongos, bass and the tres (a Cuban guitar) switching to congas in 1940 to join a desired band. By 25 he had moved to the States and began to have opportunities playing with Dr. Billy Taylor and other jazz musicians. Famous for having developed coordinated independence on the congas, he began playing three of them at a time when others were only playing one. The story goes that when Candido came with a band from Havana to the U.S. in 1946 to play at the Tropicana, the band was offered a 6-month tour. "There was no budget for both a quinto player and a conga player, and at that time, the quinto player had to play the rhythmic figure of the specific dance while the conga player played the basic rhythm, keeping time. I offered to do both if they would pay me something extra," Camero said. He not only began playing both parts, but also improvised and sometimes played cowbell and guiro. Another innovation attributed to Camero was the practice of tuning the congas to specific pitches to be able to play melodies. He mentioned that he had loved classical music and had been inspired to do this after seeing a timpani player tune his drums to fit a particular piece. Candido has recorded and performed with such jazz luminaries as Charlie Parker, Dizzy Gillespie, Miles Davis, Duke Ellington, Tony Bennett, Sonny Rollins and Bilie Holliday. When asked how he was so successful at being able to adapt and play with so many different types of players, he responded, "My ears are like radars, no matter who I play with I go with what I hear, with the feeling of the music, I just listen." 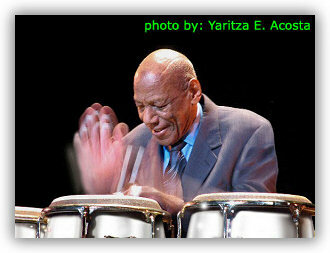 Candido ended the hour by singing and playing the congas, demonstrating several rhythms including the Bolero, Mambo and cha-cha while highlighting the differences of each. His sound and feel mesmerized the audience, making it clear why he is a "Jazz Master".